Logicbroker offers the ability to map your custom shipment method codes on Orders and Shipments to the standard codes within the platform. When receiving an order from your channel/retailer, you can use the standard codes to map to your existing (custom) codes available in your system. Shipping methods are normally defined by their carrier and service level. To simplify the identification of both, we consolidate the two (carrier and service level codes) into one standard code. This standard code can then be mapped to a custom identifier set by you to receive on Orders and send on Shipments. Creating this mapping will ensure the correct codes (both carrier and service level) will be sent to your channel/retailer in full compliance. You can avoid mapping shipment codes and have all codes for shipments defaulted to what is received on the order. Contact support to have this configured for all of your channels/retailers. If you plan on using a custom code, you will need to set these up in both stage and production environments. You can see which standard codes are available by your channels/retailers by the Used by Partner check box. The codes checked are ones you should expect to receive on orders and required codes to send on shipments. Click Edit to add your custom codes for automatic mapping on the order and shipment documents. Once these are set you will receive the code on orders and can send them on shipments. For more details on how which field to add these continue below to How Shipment Method Mappings work. How do Shipment Method Mappings work? Receiving or sending your codes will differ depending on the standard format you are integrating with. Below shows how ship methods are provided for each integration format. For more details visit the document specifications for Orders and Shipments. In the portal, if the mapping is setup and receive an order with the standard code, you will see your custom code under the Shipping & Payment Information section. If there is no code setup, you will see the Logicbroker Standard Code. If the channel/retailer does not use standard codes, the raw value will be shown. 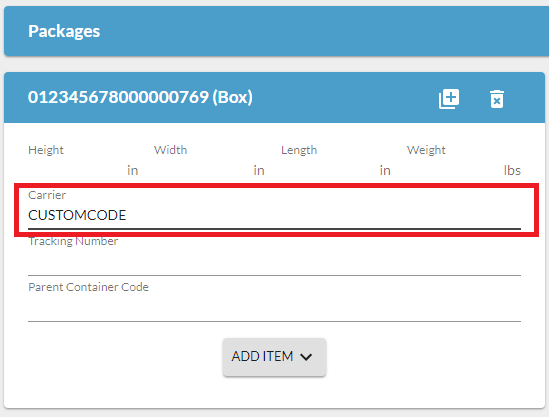 When creating shipments, you can either enter a Standard Code or your custom code under the Packages section. The Standard Code can be selected from the drop down for normal parcel carriers, or a custom code can be entered in free form. For receiving orders from your channels/retailers you will see your shipment method information in the header ShipmentInfos array. This will be shown in the first ShipmentInfo object. ReceiverClassCode will be your custom code if one is setup. ClassCode will be the Logicbroker Standard Code or the raw channel/retailer code if one is not mapped to the standard. SenderClassCode will be the raw code originally sent by the channel/retailer. When sending Shipments, all ShipmentInfos under the ShipmentLine should contain the ClassCode value. This can be either a Logicbroker Standard Code or Custom Code that was setup in the Shipment Method Mappings. For receiving orders from your channels/retailers you will see your shipment method information in the header TD505 element. The TD505 will auto-populate with the Custom Code if one is setup, if not the Standard Code will be used, and if neither is a available the raw original value will be sent. TD503 will auto populate with the standard carrier code and TD512 will auto-populate with the standard service level code as well. When sending Shipments, the TD505 element under the Shipment HL loop will need to be provided. This can be either a Logicbroker Standard Code or Custom Code that was setup in the Shipment Method Mappings. For receiving orders from your channels/retailers you will see your shipment method information in the ShipMethod column. The ShipMethod will auto-populate with the Custom Code if one is setup, if not the Standard Code will be used, and if neither is a available the raw original value will be sent. When sending Shipments, the ShipmentLine.ShipmentInfo.ClassCode column will be used to populate the your ship method. This can be either a Logicbroker Standard Code or Custom Code that was setup in the Shipment Method Mappings.